As the game progresses, I am going to keep track of the active players, their character, and their location as best I can right here. This will help with confusion as the game progresses. I will be adding detail as you all reveal the detail about your character. I know there is some mystery right now, but that is for anyone who is wishing to lie or use a fake name. Mordrin is in general that of a typical slayer, orange crest and beard, through not as long as some show that he has not been a slayer too long. He has a number of tattoos and scars, but his right ear is somewhat ragged with a few chunks missing. Unusual for a slayer, he wears a mail shirt, though this is not new, and though maintained has obviously seen battle. If someone could look long enough and deep enough at his eyes, they'd notice that in the dark brown iris there are flecks of green, an unusual trait from birth. Twin axes hang from his two belts, one on either side (one on each belt), and his great axe is diagonally over his back over his cloak but under his pack. He wears an opal ring on a chain around his neck. Though tall, handsome and well-built, Lars' expression, tone and personality appear cold, distant, and highly irritable. He talks with a laconic and sometimes condescending style/tone. He has amber eyes, dark brown hair, and a beard to match. He wears a mail shirt, with worn and mattered brown leather gloves, boots, trousers and gamberson. His sword hangs on his belt while his bow and quiver are strapped to his back. He wears a talisman of Taal proudly around his neck. Valente is an average built Tilean who sports a broken nose set between hazel eyes which his jet black hair hides. He wears a mail shirt over leather armor and sports an open faced helmet upon his head. His uniform bears a crossed sword and torch in gold, set on a scarlet field with gold trim. He has a sword strapped to his waist with a square shield strapped to his back. He carries around a large, 10 foot long Tilean Pike in his hands, the right most one missing the pinky. Yarick is wearing gray pants, a red cloak, and a mighty helmet with his orange crest poking through the top. He looks pretty tired and has a couple scars on his face and torso, his dyed orange beard is braided and has many silver beard decorations. About his person he carries an assortment of different sized axes, all finely crafted. To an Umgi (human) Drazhdrakk appears to be a short youngster with black hair and deep dark ice blue eyes although his long blakc braided beard is a giveaway that his is a Dwarf. A Dwarf dressed nearly all in black with the exception of his dark black and grey stripped trousers that are tucked into knee high leather boots. Upon looking closer the observer will notice he is wearing a muslin shirt under a padded leather jerkin worn under a sleeveless chain mail shirt. His outer garment is an ankle length black coat. Upon his head is a mailed coif which is worn under a large brim black hat. The hat band is decorated with teeth; goblin, orc, or hob goblin. When he speaks Reikspiel it is with a Nuln accent. What weapons the casual observer can see is war-hammer, a belt knife, and a buckler slung over his shoulder backpack. He is a dour looking prospector with a black beard and dark eyes. His horned helmet and armour speak of the the far North, his clothes are stained and patched from long travel, and in a style a few hundred years out of date. He has a ragged fur cloak and a large double handed hammer slung at his back. A closer look shows silver skull icons on his belt and buckles, revealing decent from the ancestor Gazul, and the letters 'hold fast' tattooed in runes across his knuckles. The tavern was a dark, grimy affair. It was filled with hazy smoke and the smell of various liquids, both in mugs and on the floor. Leopold Dietrich had entered as the sun was westerning and night was approaching. Soon the tavern begins to fill up with men looking for something to help them forget the trials of the day. One such group of two people sits at the booth next to Leopold and he cannot help but hear their conversation. Since they are just sharing gossip, they aren’t particularly silent or worried about anyone hearing them. A third person slides into the booth as the man known as Sigfried and Alfred look up and smile. Edited by Glyfi Ironbeard, 08 January 2019 - 01:34 PM. This campaign will use WFRP 2nd Edition rules. It will be more a campaign style game as opposed to the last one I ran. It is way more open ended and will include 10+ locations to explore, each with various buildings and places to visit within. It will have 15+ factions that you can become involved with, each with their own story. The region itself also includes 6,000+ years of history to discover, ancient ruins and dungeons to explore, and various monsters lurking about. Also, due to popular demand, this campaign will focus on skills outside of those used specifically in combat. Languages will be important with people from all corners of the Old World present. Things like reading/writing, spotting secret signs and marks, outdoor survival (when traveling in the wilderness outside of town), and especially social skills (Charm, Blather, Gossip, and Intimidate) will be utilized. The story and history of Haven Rock will come out based upon how well you interact with those around you and investigate your environment. 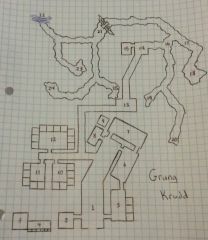 If you prefer to go bash in some heads, there are a number of different ‘dungeon’ type experiences to choose from. Just remember, death can come quickly in this rule set, either by a goblin spear or an upset townsman’s knife in your back. If your character meets its end, feel free to start a new character. Due to the open environment design of this campaign, be aware that encounters may be way above your immediate abilities or even beneath you. Always assume the worse and be cautious. This game will allow you to purchase homes, in fact you will be required to make arrangements for where to sleep and relying on a rock to lay your head will not be beneficial in the long run. The city will be fully fleshed out, you can find jobs that you work at when not out adventuring. If you know that you are going to be unable to participate for a month or longer, retire your character (Let the character become part of the city and work) and come back to it later when you have a chance. I plan on running this for as long as I’m physically able and there are those of you who are still interested. I do ask that if you decide to play, you attempt to check in either daily or every other day, at least long enough to answer a question or respond to another player’s post. I know that life happens so we will all try to accommodate if you let us know ahead of time. Each character will start off with 1,000 xp to get everyone started. This will not be enough to create a powerful character within the Warhammer World so think just a plain, average person. Race and Career choice will be important. Each character will be provided equipment and money depending on their race and career choices. Each character will start with additional knowledge, sent via PM, based on their race and career choices. Finally, each character will be more accepted to various factions, and might even start as a member of a faction, based upon their race and career choices. This will be more campaign oriented, so character will achieve xp to level themselves as the story progresses. For anyone that has played a Warhammer Campaign before, I will be more generous with xp then the guildlines indicate, just to keep the game moving at a relatively fast pace. Please PM me all character choices, as this will allow those who wish to play a more ‘dubious’ character the freedom to control what they wish to share with other players. 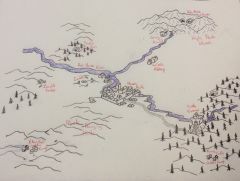 Below I have detailed some races and careers that would be common in the Border Princes and how they might lead a person to travel to Haven Rock. If you have other ideas, please let me know and we can attempt to work them into the story. Thank you for working with me on character creation. This adventure will take place in the Badlands, in an area just south of the Border Princes and the Blood River. Below is a description of each nationality and race that would be commonly seen in this region. Bretonnia: A number of Bretonnian people inhabit this region, mostly having come here on various errantry campaign or just seeking a better life among fellow nationals, this people is vary numerous in this region. It was the Bretonnian knights who first drove the greenskins out of the Border Princes and made the region safe for human settlement. Empire of Sigmar: As the land here was made safe, numerous Empire Knights rode forth to claim their own glory not wanting to appear weaker than their Bretonnian neighbors. Other people of the Empire also immigrated south, looking to make their fortune in this unexplored wilderness. Some just wanted to disappear into the wilderness away from the laws of the Empire. Tilea: Just next door to the Border Princes, it was only logical that Tileans would take interest in this vast expanse of land. Through the years, a number of mercenary companies sought their fortune in these lands where the competition wasn’t as fierce. Others wanted to explore, seek out lost heirlooms of the dwarfs, or create their own power base. Kislev: These people were originally nomadic and forced to flee into what is present day Kislev by the Ungol tribes. With support from the Empire, they settled down and created cities but the fierce desire to roam and see new lands never left some. For these adventurous types, the Border Princes is an area where they can stretch out and carve out their own existence. This group of people isn’t as numerous as the other human groups. Norse and Estalian: While there may be a handful of these people in the region, they would need a very good reason for being here. For the Estalian, it could be because they are a mercenary who travelled here on an assignment. For the Norse, they may be cowardly or a truly desperate person wanting to escape as far away from the Chaos Wastes as possible. Araby: This group would be present in this region as well. Most of the traffic would be via ship as the lands of the dead and a vast desert separate the modern nation of Araby from the badlands. These people could be traders, pirates, or seeking out lost treasures. In addition to humans, the Border Princes are also home to a number of Dwarf Holds. To the north lie the Black Mountains and Karak Hirn and Karak Izor, both Dwarf holds of the Exiled Dwarfs. These Dwarfs do not answer directly to the High King of the Dwarfs, Thorgrim Grudgebearer, but are on good terms with the Karaz Ankor none the less. The Border Princes also fall in a triangle created by Dwarf Holds of the Karaz Ankor. Barak Varr is to the west on the coast. Karaz-a-Karak can be found to the northeast of the Border Princes, and Karak Azul is found to the southeast. In ancient times, this realm had many settlements and trading outposts in the Border Princes until the Time of Woe drove them out. Other races such as Elf, Halfling, and Ogre would be less common or flat out shunned in this region. Since the people of this region must scrape by against impressive odds, there would be more prejudice against the elves than normal. With a lack of forest, Wood Elves would be nonexistent here, Dark Elves would have little reason to seek slaves here as there are more accessable places closer to Naggaroth, and High Elves would only be looking for some powerful artifact lost in the War of the Beard to come here. Halflings would have to be exceptionally desperate to come here to seek out a living and would probably all be some sort of criminal. Ogres, while common in this area, would be viewed as a threat and would really have to prove their good intentions to be allowed access to a town, probably being slain by the watch while trying. While all sorts of people come to the Border Princes, a few common callings are more prevalent than others. Below is a list of careers that most travelers in this frontier land would fall under. Others are possible but would need a good reason to be so far away from their main place of function. Adventurer – The catch all class. Anyone can get delusions of grandeur from time to time. Anchorite – This is a strange hermit that wonders the Border Princes and Badlands. Apothecary – The minerals and foliages of the Border Princes are different than those found elsewhere. Apprentice Necromancer – Little law enforcement and near the Lands of the dead, what else could be better. Apprentice Wizard – Ruins to look through in search of powerful magical artifacts. Badlander – These are people born and raised in the badlands. Bone Picker – This scavenger thrives in a place with little law enforcement, though the dead have few riches here. Bounty Hunter – When local law enforcement doesn’t cut it, these individuals step in to see justice served. Camp Follower – One of many people that have followed the various crusading armies south. Cenobite – This person is a follower of a cult that has set up in the badlands. Entertainer – Even in a place this dreary people have a need to be entertained, and will pay for it to boot. Farmer – Someone has to feed these people, even low life scum need food. Gambler – Just another form of entertainment that people pay to lose. Grail Pilgrim – Bretonnian that came here on an errantry campaign. Hunter – The seek out animals to slay for meat. Initiate – Lots of reprobates and outlaws equal a perfect mission field to promote your faith. Knight Errant – Bretonnian that came here on an errantry campaign. Mercenary – These hired swords come from everywhere and constitutes the majority of garrisons and law enforcement. Miner – These are most prospector types who are seeking to hit it rich. Outlaw – With little law enforcement, these people thrive on taking from others. Peasant – These are your plain old folk that immigrate. Pikeman – These Tilean mercenaries are some of the best around. Pit Fighter – Just another person people give money to for them to entertain them. Rogue – A person who has a tendency to get into situations. The better ones even find a way out. Smuggler – Did I mention the lack of law enforcement? This group takes advantage of the situation. Soldier – Generally part of a crusade or errantry campaign, some stay around to provide garrisons. Squire – Generally this type of person has arrived as part of a Crusading campaign. 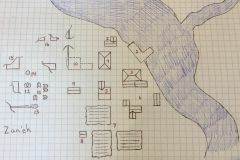 Student – Lots of ruins to research. Thief – Law enforcement, non-existent, enter a thief. Thug – No laws, thugs take what they want. 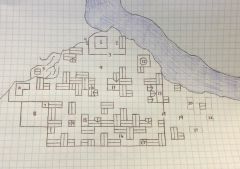 Tomb Robber – Lots of old ruins to explore for good loot. Tradesman – Traders and specialists are always in demand for when someone needs to spend their loot. Troll Slayer – Border Princes are the frontier, lots of good beasties to go kill down here. Vagabond – Some people were just born to wander. Some even wander into the Border Princes. Zealot – These people generally arrive as part of a Crusading campaign. Edited by Ragnar Alpaca, 11 December 2018 - 01:43 AM. The following is a list of important information and things that might make the game better for you and others. I’ve tried to break it down into categories for ease reference. In case anything odd ball comes up, or isn’t discussed here, I’ll let you know about it at the time it happens and try to update this post as well for future reference. The play thread will be for all In-character (IC) dialog and story. This Out of Character (OOC) thread will be for all questions and discussions related to the story. Feel free to PM me with any thoughts or concerns that you have as well. That said, due to the nature of this type of game, there may be times that I will include OOC information in the Play Thread. I will use brackets [ ] to separate out the OOC material and will also use a dark grey color for the text to differentiate further. Secret Actions: Also note, if you want to perform an action but don't want anyone else to know about it, the PM thread will work. For example, if you are a thief and want to pick pocket another PC, tell me in a PM. I'll make the rolls in secret and no one will no what happened. Combat takes place in round by round timing, where each round is approximately 10 seconds. Each round, a character is given an action or 2 half actions to perform. The following is a quick list of some of the most common combat actions. Ready (1/2 Action) – pickup an item into hand or draw a weapon into a hand. Aim (1/2 Action) – Gain a bonus to hit chance. Attack (1/2 Action) – Make a single attack. Guarded Attack (Full Action) – swap some ability to hit for a better chance to dodge or parry. Swift Attack (Full Action) – make a number of attacks equal to the character’s Attack (A) characteristic. All Out Attack (Full Action) – Gain a large bonus to hit chance at the inability to either dodge or parry. Defensive Stance (Full Action) – All enemies take a penalty to hitting you. Parrying Stance (1/2 Action) – Gain the ability to make a parry attempt if an opponent hits you. Maneuver (1/2 Action) – Move to a more advantageous position while engaged. Feint (1/2 Action) – Chance to make your opponent unable to dodge or parry the next attack. Run (Full Action) – Cover a large distance. Things like Reload and Cast Spell are dependent on the weapon or spell being used. You can either specify your action specifically, or describe what you want to do and I will pick the action that best reflects you description. When talking with NPCs, each NPC will be assigned a reactionary disposition based on multiple factors (How you dress, your race, your career choice, etc.). This will affect how receptive that NPC is to your conversation efforts. Important NPCs will track disposition over the campaign, so be careful not to get them upset at you. When talking with a conversation, you can specify how you want your character to carry out the conversation. If you don’t specify, I will use the context of the conversation to assign a category to test for. Use brackets  somewhere in the dialog to let me know if you want a specific type of test. Blather – (Blather skill) Use to talk very fast in an effort to confuse or catch NPC off guard. Bluff – (Gossip skill) Use to lie or convince a NPC of something that isn’t true. Charm – (Charm skill) Use to increase a NPC’s disposition to you. Command – (Command skill) Use to order NPCs to take an action. Fiery Rhetoric – (Intimidate skill) Use to inspire a passionate response from a NPC. Gossip – (Gossip skill) Use to gather information, rumors, and even lies from a NPC. Intimidate – (Intimidate skill) Use to scare or coerce a NPC. Seduce – (Charm skill) Use like Charm, only more intimate and flirty, for a higher risk/higher reward type situation. Any of these may be used, whether you have the correct skill or not. Having the correct skill will just increase your rate of success. Also note that just because an NPC, or a PC for that matter, says something it isn’t always true. Some of the background information you get, some of the rumors you might hear, will be false or red herrings. Some might even be an outright lie. Finally, a number of languages will be used in the town and area surrounding Haven Rock. Please either specify the language you are using, use text color to denote the language, or both. Reikspiel will be the default language if one isn’t specified and all PCs will be able to speak that language. NPCs, on the other hand, may not. Money management will be important in the area around Haven Rock, as a number of denominations and nationalities of coin will be used. The first important piece of information will be how denominations work. The next important knowledge to know is that not all coins are minted equally. Tilean Crowns (Gold), Shillings (Silver), and Pennies (Brass) are less valuable than the Empire Crown, Shilling, and Penny. A Bretonnian Ecu (Gold), Denier (Silver), and Penny (Brass) is worth more than the Empire equivalent. A Dwarf Gold Piece, Silver Piece, or Brass Piece is worth the most. While most humans trade on a one to one basis, someone with an eye for profit (or a dwarf) will insist on extra coins from certain denominations. For instance, a dagger might be worth 1 Empire Crown but the merchant will insist on 1 Tilean Crown and 3 Shillings. There are also different types of materials that are used for weapons and armor. Gromril, Ithilmar, Silver, etc. These are pretty rare, but if you happen to run across them know that they do good things. During this campaign, I will keep track of time and the calendar day. For the most part, this is just to generate phases of the moons, planet rotations, weather, and other GM related nonsense. Specific days might lead to festivals being celebrated based on the date, but these will be detailed appropriately. For those that are interested, the year this scenario will take place is going to be 2,520 IC. This is 3 years prior to Archaon’s forces invade the Empire of Sigmar and the Storm of Chaos begins in earnest. I am using this version of the GW timeline to influence the events in the badlands, though it would be very easy to completely miss all references to this event if you prefer other timelines. The biggest factor for the PCs will be the days of the week (Note there are 8 days in a warhammer week). Due to the small town nature of Haven Rock, Marketday will be the day you will most likely find merchants setup to sell adventuring gear. You might luck into tracking down something on other days, but the chance of finding what you are looking for will be lower. Take advantage of Marketday to stock up on essentials. You might also want to watch out for the tax man on Taxday. Tracking smaller units of time may also be important for PC immersion. To this end, I don't want to say that it is 12:43 PM and will instead use broader measures of time based on sun position and such, unless your character has some way of being more accurate when telling time. This will give you a close approximation of the current time without having to worry about exacts. If a situation requires closer scrutiny, I will let you know the specific time. Throughout the course of this campaign each character will receive experience points (xp) for their actions. Successful use of social interactions will give xp, completing certain tasks will net xp, and the tracking and slaying of a goblin will also give xp. These points will be given to anyone who participates in the action that gives the points. Everyone involved in a combat will receive the points for that combat and everyone who talks with the noble will receive the points for the conversation, etc. These points will then be used to gain more skills and talents, and even to raise your character's characteristics. They can also be used to increase the effectiveness of skills. It will cost 100 xp to affect a skill, talent, or characteristic. Your choices for spending these points will be dependent upon you current career. At this point, if you have a copy of the rules, throw them out. In the normal rules, ever career had 'exits'. These were specified careers that you could spend xp to move into, thus gaining access to different skills. I prefer a more realistic system to this artificial system. In this game, if you sign on to smuggle goods and deliver them to their destination you may take the smuggler career for free. I will indicate when this happens. Basically you have to actually do the job your career says you do. To progress to the next rank, you actually have to do something worthy of getting a promotion, etc. The career you all selected at creation will be what you all start out at, but as the game progresses your choices will dictate what is available to you. Choose well. If you have an idea of what you want to do, let me know and I'll tell you how to achieve it. Edited by Glyfi Ironbeard, 16 December 2018 - 02:53 AM. I'll keep this post updated with areas you have explored and the maps of the main settlements. This map needs to be finalized. Edited by Glyfi Ironbeard, 02 January 2019 - 06:26 PM. He is a stocky man with a limp. He has a deep voice and matted dark brown hair. His eyes are green and deep set in his overly round face. He loves to yell at people that he can bully around and wears a Canelleto's Mercenary Company livery over his armor of polished mail. This dwarf has cold, calculating black eyes that peer out of very dark, jet black hair that is pulled back in a ponytail. His beard is spiked out and held in place with some sort of grease. A short, skinny man, von Klink, or 'Klink' to his friends, runs the Drunken Snotlings and loves to gamble. He is dressed in tawny colored clothing and generally wears an apron. He has salt and pepper hair that is balding rapidly and bright blue eyes. This young woman is in her late teens or early twenties. She is fairly attractive with a bright smile and bright blue eyes. She has dark brown hair which she keeps pulled up in a bun and wears a tawny colored dress with an apron on when working. This is a middle-aged man who is the embodiment of a Priest of Sigmar. He wears robes with a breastplate and carries around a warhammer. He has green eyes and keeps his head shaved. He is an older man with a commanding air about him. Beneath his long, silver hair are yellow eyes that radiate power. His fine, golden robes hang loosely about him. Older man who appears bored and lonely. This man can usually be found sulking to himself. He has mischievous, green eyes and brown hair. He wears faded and dusty clothes of a muted color. This younger man has blue eyes and blonde hair. He can usually be found holding a bottle of spirits while attempting to read a book upside down. She is a middle aged woman and very bookish. She has very light brown hair and faded green eyes along with a number of earrings. She wears very fine robes of a lavender color and carries an ornate staff. Edited by Glyfi Ironbeard, 04 January 2019 - 12:47 PM. As an update, I went ahead and edited some of the place holding posts above with information that might be helpful. I'll keep these first few posts up to date with information that you can use. We currently have 3 Dwarfs and 1 Human signed up with characters. I will not post any other information about these characters so that they can share the information they want to with everyone. There are a number of others (2) that have expressed interest and are thinking about their characters. If anyone is sitting on the fence, please join us. The more the merrier as far as I'm concerned. There isn't going to be a cutoff for sign up, so send me a PM if interested and I will get you more information and help you get started! I am going to limit the number of players at a time to between 10-12. For now, 12 will be a hard limit if we reach that number (subject to increases if I think my time and resources can manage it). There is actually enough material in this region to keep multiple groups active, so we can definitely split into multiple groups if you all prefer. Each group will probably be ran in separate threads if this is the case, much like TBO ran the Balor campaign. Edited by Glyfi Ironbeard, 14 December 2018 - 02:22 PM. For those playing, how do we want to handle measurements? I generally use miles, feet, yards, pounds, Fahrenheit, etc. The rules are written with this in mind so I had planned on using them. Is everyone okay with this or would you prefer I convert measurements to metric or the equivalent and include both? I like Imperial measurements and they fit better in the Old World. Maybe Bretonians can use centimetres!! Don't mind. However, Imperial measurements seem the most thematic. I've made a lot of progress in getting the campaign written. I should be about ready to run it at the first of the year if you all want to go ahead and get started. I have most of the NPCs finished, or at least fleshed out enough to be able to run. Most maps are now ready and most places have descriptions. I've also worked with everyone who has finished character generation and have started getting them background information and personal goals. If you are still thinking about joining, we would love to have you join. Even once we start, due to the nature of this campaign, we will still be happy to have more join. If you don't have time now, but will in a few months, feel free to send me a PM and we can get you worked in when your ready. I also want to give a heads up about the nature of this sandbox type adventure. I will NOT be scaling encounters so be careful. Some of the personal goals may be achievable when we start and some may be best saved to the end. This game will have everything, so be mindful that you don't walk into an unwinnable situation. Sometimes discretion is the better part of valor. That said, I wish everyone a very Merry Christmas and a Happy New Year, and look forward to anyone who wishes to join up, and I will remain in touch with those that have signed up via PM. For everyone waiting on an update for character preparation, I may not be on much in the coming days due to sickness and family being hospitalized with heart issues on my wife’s side. I’ll try to keep up with stuff when I can. Just wanted to give you a heads up if I’m not on as much in the next little bit. Best wishes to you and yours, hope everyone is okay. Don’t worry about us, you be where you need to be, and we’ll be here when everyone is better. Hope that everything ends up ok, Glyfi. Wife’s grandmother has had a few stints and should be released from hospital soon. On the home front, still have two out of there beardlings with fever and I now have it as well. Thanks for the well wishes. As soon as I can think straight again I will get you all updates. Fever is broken, I should be around again. At least up until Christmas. Once the new year rolls around we should be able to get started in earnest. Grandfather Nurgle shall not prevail over this azul! I have just sent most everyone with a full fledged character a PM with some background info. There are currently 4 people that are officially ready to start. I have also spoke with a few more that will hopefully be joining us shortly. A few are just waiting for the hectic holiday season to end so they can slow down to think on their character. I'm still planning on starting with the new year, so we can start getting to know each other's characters. Sign up will continue for anyone who wishes to join, regardless of when they want to hop in. So some extra material for you to think on as the game begins, since some of the same questions are being asked and I don't remember who I told what too at this point. First, pretty much everyone was told that the sun is beginning to set and in a few hours night will fall to begin the game. I suggested that you find accommodations for the night. Some of you have already discovered that I am going to 'nickel and dime' you for food, drinks, lodging, gear, etc. There are multiple ways to find accommodations as the game is meant to be sandboxish. You can sleep outside, sleep in a common room, sleep in a private room, find lodging with allies you have made or with employers, and you can even buy your own house/build one with the proper time and coin. Each option will have consequences/rewards. For instance, if you decide to sleep outside with no bedroll or tent you might be exposed to disease, illness, predators, bandits, etc. while sleeping in a common room would eliminate the predators for the price of the money involved. If the people you are sleeping with have an illness you might catch it or they might be thieves and help themselves while you sleep. A private room would eliminate catching a disease from a bunk mate, but a determined thief might still break in, etc. The goal is to force you to make the tough choices in everything. You can go a day without food and save a few pennies at the cost of some slight stat decreases but go to long and you risk starvation. Don't appropriately gear up to wander around in the wilderness and you can die of dehydration. Get an illness and let it go without treatment, gain something debilitating or worse. Everything has a risk/reward aspect to it. Paying more money generally gets the better results but then you find yourself without funds within a short period of time. Second, this game will be hard depending on the choices. Due to the sand box nature of this game, you can face a wide range of encounters. I will NOT be scaling encounters. If you decide to go face down a wyvern be warned that, unlike the Sun Oath game, I will not have a cannon nearby to save you if the encounter goes south. If you decide to take on a coven of vampires and an army of the undead, lets just say it will not end well. Be warned, sometimes it might be better to run and fight another day (unless you are a slayer in which case you hopefully earn your redemption and honor). I know the wyvern failed to impress the fatal nature of the combat system, but the other battles hopefully showed how the game plays out. Just know that some of those injured in the last game would still be injured by the time they escaped the mountain. Ragnar had close to two months before he was completely healed from the last battle. Orrid wasn't much better and Gunther had received permanent damage from his battle with the vampiress that would need intense help to fix (magic, operations, 'special' blends of herbs, etc) and could just as easily make matters worse. Also since I believe some of you have played Dwarf Fortress, remember that losing is fun! Finally, since you all wanted a bit more moral dilemma added to the last game I may have went over board for this game. Each of your characters will be unique in the background knowledge that you have and your goals. What you chose to share with each other is up to you entirely. You can flat out lie to the other characters if you want. Just remember that the others can see what you look like and what you do, unless you use disguises and take secret actions (PM me if you want to try to pick pocket each other for instance ). The NPCs you meet may present a challenge for you all. The same NPC may help one character to achieve their goal but hinder another. What you do will affect how the game plays out. What would happen if one character needs to collect a bounty on an NPC that is the direct employer of another character? Be aware that the moral dilemma may be between each of your characters as well as you each try to advance your own narrative. There are factions that you can help or move against, each with their own rewards/penalties. Moon cycles and weather patterns will be tracked throughout the game and can cause various effects. The environment itself can cause issues as both above ground and subterranean locations are present (Can you see in the dark or do you need a torch?). There will be curses, magical effects, mutation causing locales, and holy shrines that you can find. Everyone has a dooming that you can either discover through finding a fortune teller or as bad luck happens around a specific event. The available quests will range from unmasking conspiracies in the urban locations to going on an old fashion dungeon crawl. There are plots that are a few millennia in the making and some that are just being hatched for you to discover. I say all of this to point out that I really tried to create an experience for everyone involved. The ultimate goal is fun, so if at anytime you feel like the mechanics are getting in the way, I will either hide them better or jettison them altogether. I don't want to bog us down on the mechanical aspect so do what you feel is natural for your character and I will try to use the choices you make to frame the narrative. If at any time, you feel like the game is becoming a chore and is no longer fun, let me know and we can adjust it. I hope this answered some of the questions and didn't raise to many more. If you have other questions, let me know and I will try to go over all concerns prior to game launch. We are getting closer to game launch by the way! Game will begin on the 1st baring any technical glitches or unforeseen circumstances and I am excited.